Easy to read text; covers all the major aspects of this single seat series; superb colour profiles. 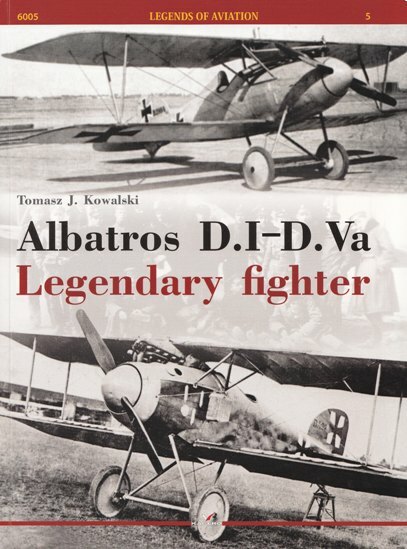 A publication that gives enthusiasts a good overall narrative of the Albatros family of fighters. Timing can be everything in publishing and it seems that Kagero have hit the mark with their latest volume in the “Legends of Aviation” series. With the recent release of the Wingnut Wings kits in 1:32 scale and now the new 1:48 range of Albatros fighters from Eduard, this book should be popular. So what do we get? Between the soft card covers are 80 A4 pages of text and images. The former is all in English and the latter encapsulates the colour artwork, illustrations, as well as period photographs. The narrative starts with the introduction of the Albatros D.I and its subsequent development into the D.Va. The various prototypes are also considered, as well as the floatplane derivative which was known as the W.4. When the licence built versions of the German fighter were produced by Oeffag, the result was better than the original. The author talks about the changes made to achieve these advantages and then dedicates a chapter to a detailed description of the parent Albatros D.III. Further sections cover the combat history of the Albatros fighters and this includes its role in the Austro-Hungarian and Polish Air Services. A discussion on the colours and markings follows, with the book being rounded out by a series of appendices. One of these tables lists the equivalents racks of the Austro-Hungarian, German and Polish personnel. 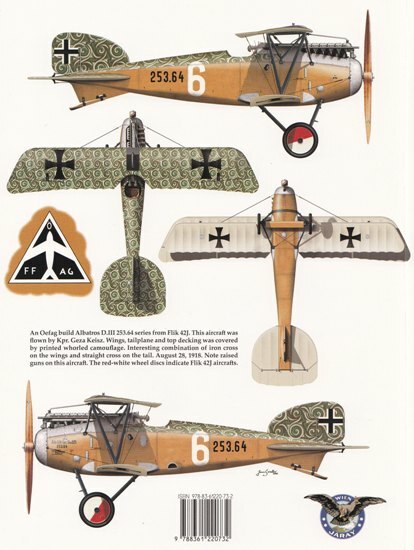 Another gives examples of Albatros Jagdstaffel markings and the last provides basic technical specifications for each variant. Scale plans are not a focus of this publication but there are a few sketches to show some of the structural details. These come courtesy of drawings by Jean Lagorgette of L’Aerophile and Zych Plodowski circa 1925. Assisting the narrative is over 100 period black and white photographs. Unfortunately these are very poorly reproduced and are obviously the result of using very bad copies of the originals. In many cases the detail is shrouded in a veil of darkness which makes it near impossible to glean any useful information from them. Sadly there is also the odd caption problem, the most obvious being the misnaming of an Albatros Dr.I as a Dr.II. But even more disturbing is the perpetuation of the so-called “combat” photographs which have long been known to be fakes. Purists will also find a typo or two in the text but fortunately this doesn’t detract from the main story. At the rear of the book are 9 pages of artwork. These colour profiles are superb and cover a wide range of variants. They are the work of Janusz ?wiat?o? and will really inspire any modelling juices the reader still has. Overall this book will allow the purchaser to get a very good grounding in the aircraft and its combat history. The text is pleasant to read and is diverse in its coverage. Those wanting to compare variants using general arrangement drawings or scale plans are best directed elsewhere. The same holds true for detailed photographs. Despite this, there is still plenty to like about the publication and it can be considered a valuable “one stop” reference for those that want all their information between a single set of covers. Thanks to Casemate UK for the samples.